most conveniently for our purposes, chameleons. This paper is a heavily edited, enlarged, and updated version of a paper delivered to a conference at Oxford University on "Clausewitz in the 21st Century" in March 2005. It is designed for presentation in electronic format on the web. Two rather different (and shorter) published articles have been derived from this working paper: Christopher Bassford, Chapter 4, The Primacy of Policy and the Trinity in Clausewitz's Mature Thought, in Hew Strachan and Andreas Herberg-Rothe, eds., Clausewitz in the Twenty-First Century (Oxford University Press, 2007), pp.74-90; Christopher Bassford, "The Strange Persistence of Trinitarian Warfare," in Ralph Rotte and Christoph Schwarz, eds., War and Strategy (New York: Nova Science, 2011), pp.45-54. See some interesting analysis of this paper by ZenPundit, et al, in "Bassford’s Dynamic Trinitarianism Part I" (September 10th, 2012) and "Bassford’s Dynamic Trinitarianism, Part II" (September 24th, 2012). I am a historian. Or, rather, I was formally trained as an historian. Today, as a "Professor of Strategy, I'm not sure I can still characterize myself that way. But my approach to teaching strategy is essentially an historical approach. I routinely start out a new seminar group with the question, "So: Why do we study history, anyway?" Invariably, some earnest young colonel will volunteer that hoary old line from George Santayana, "Those who cannot remember the past are condemned to repeat it." I will then fix what I hope is a withering eye on this student and say something to the effect of, "Well, Bubba/Bubbette, I've got some bad news for you: Those of us who do remember the past are also condemned to repeat it. We simply have the added pleasure of knowing we've been down this damned rathole before." Unfortunately, even this minor pleasure does not appear to be widely shared. It has been barely one generation since the American defeat in Indochina. Nonetheless, in a dazzling display of historical forgetfulness worthy of the brain-damaged female protagonist of the movie "Fifty First Dates," our national security community appears to be stunned to discover that warfare can be waged by groups that do not look at all like the cast of the 1960s TV show, Hogan's Heroes. And many of the worst offenders are ... military historians. Prompted by what evidently appears to many writers to be the utterly new kind of warfare waged by organizations like, say, Al Qaeda, they spin out bold new buzzwords designed, shaman-style, to capture the spirit of this earthshakingly new innovation by giving it a name. Some popular examples are non-state war, "Fourth- (or Fifth-) Generation War," and the stunningly uncreative "the New Warfare." Most misleading of all (to the few who are equipped to assign any meaning whatsoever to the phrase) is "non-trinitarian war," a term coined by Israeli military historian Martin van Creveld to encapsulate a new, allegedly non-Clausewitzian approach to theorizing about war. In reality, Clausewitzs Trinitarian concept bears little resemblance to the concept Creveld claims to be refuting. The purposes of this paper are to examine the meaning and significance of this trinity and to explore its continuing relevance to contemporary political/military problems. A warning to hard-headed realists, operators, and practical men: Clausewitz was a practical soldier and he intended his work to serve as a very practical approach to real-world complexitieswithout avoiding the complexity. If you are one of those people who are repelled by the allegedly hair-splitting character of Clausewitzian theory, I advise you to stop reading now. I would also suggest that you quit—today—any profession connected to the higher levels of politics, public policy, or war. * an Original Intent school, primarily historians narrowly focused on Clausewitzs own influences, drives, goals, and often the presumed limits to his thought and perceptions in the specific context of Prussia in the periods immediately surrounding the wars of the French Revolution and Napoleon. * an Inspirationist school, primarily present-minded political scientists, strategic-affairs types, soldiers, and business theorists who are interested in freely adapting Clausewitzian concepts exclusively to current issues. It also includes some historians interested in applying Clausewitzian ideas to historical problems outside the boundaries of the modern West. * a Receptionist school,*2 primarily historians who are interested in the ideas and impacts of Clausewitzian inspirationists over time. * an Editorial schoolpeople who think they have clear ideas as to what Clausewitz really meant and how to edit the rough draft Clausewitz left behind in order to more faithfully convey his concepts. 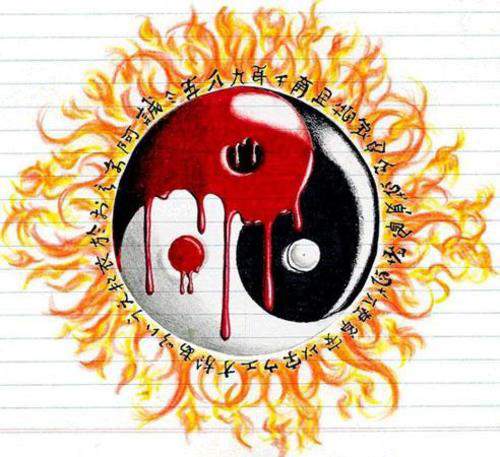 In practice, I find that most of ushowever much purists of one stripe or another might decry the heresies involvedtend to straddle these various schools to varying degrees, at varying times, for varying purposes. As one very bright business strategist once said to me, It would be nice to know whats true, of course, but the more important question is, What is useful?*3 After all, most readers of Clausewitz are fundamentally interested, not in understanding Clausewitz, but in understanding WAR (or perhaps its analogs, as in phases of business, etc.). In pursuit of the latter goal, each of the schools has a valuable contribution to make. Fortunately, I find that my own unfolding understanding of war itself seems to keep uncanny pace with my understanding of Clausewitz. As a final prefatory comment, I should note a certain bias, of which I am well aware, in my own thinking. This is a bias towards universalizing Clausewitz, who, after all, sought with Vom Kriege to formulate a valid general theory of war. Thus I think it would be a "good" thing if the entire war-studies community could use the essentials of Clausewitzian theory as the common basis for comparative military-political studies across all human societies and history. A common understanding of the Trinity would do much to advance that project. While I am under no illusions that the achievement of such a common understanding is imminent (which would make me certifiably insane), that goal is implicit in the very existence of military theory as a coherent field of inquiry. Our current utter confusion will continue to prevail until we find some common theoretical structure within which to conduct our debates. I do not have space to explore that notion here to any great degree, but it certainly influences my choices in translation and in defining terms like policy and politics: We want definitions that are not confined to Prussia in the era of the French Revolution, the Westphalian-model state system, or Western civilization. As, I think, did Clausewitz. Because so much of the debate over Clausewitz tends to reflect an academic instinct for the capillaries, I offer this bias as a convenient target for anyone seeking the jugular vein of my analysis. The original version of this paper was instigated by Andreas Herberg-Rothe, who invited me to speak on this subject at Oxford University's conference on "Clausewitz in the 21st Century" in March 2005. I have been thinking systematically about this specific passage in On War since about 1991, and I am familiar with its intricacies and sandtraps. Thus it came not entirely as a surprise to me when the project began to metastasize. There is hardly a word or phrase in section 28 that cannot provoke debate, long before we get to wrestling with the section's overall meaning and import. The result is the present, bloated, digression-laden paper. Conceptual trinities are inherently problematic, but especially in the context of contemporary American politics and policy. It is difficult enough to convey the meaning and implications of any single idea. But the world in which we actually operate is, despite what partisans and fundamentalists of various stripes like to pretend, never the simple unfolding of any one concept or force. Unfortunately, expanding a discussion even to two coexisting or contending ideas requires a philosophical leap into the obscure realm of dialectical thinking"especially if ones purpose is more sophisticated than seeking merely to eliminate one of the two options or to split the difference. Attempting to adjust to the complex situation routinely created by the ongoing collision of two real-world facts thus makes one, in modern parlance, a "hopeless flip-flopper. Juggling the meaning and implications of three interacting realities makes even splitting the difference obnoxiously difficult and is utterly beyond the pale of acceptable political analysis. As famed political strategist James Carville notes, "If you say three things, you say nothing. "*4 This contemporary reality makes sensible thought impossible, so we will ignore it in this paper. Many of the difficulties specifically with Clausewitzs trinity seem at first to turn on issues of translation from the German into English. We will have to look at some of these issues. Ultimately, however, the problem has little to do with the German or English languages or cultures, per se. Rather, it derives from the different ways in which various individuals, disciplines, and subcultures understand the universe (or, as many phrase it, "How things really work")issues raised most ably by Alan Beyerchens analysis of Clausewitzs worldview in terms of nonlinear mathematics and Complexity science. *5 For reasons of space I will have to leave most of the staggering implications of Clausewitzs choice of nonlinear scientific imagery to Alan. The two issues are not unrelated, because both turn on the interactivity of interdependent variables. But we can discuss, e.g., the word-choice issues regarding policy, politics, and Politik in rather traditional terms without invoking any new cosmic paradigms. The overarching problem with attempting any short discussion of the Trinity in isolation is that, however much various writers may try to treat the Trinity as a discrete theoretical nuggetindeed, as an afterthought, a conception that allegedly popped into Clausewitzs mind in the last phases of his unfinished writing process and was never effectively incorporated into the existing body of his theory*6in fact, the Trinity is the central concept in On War. I dont mean central in the sense that, say, Jon Sumida applied in his Oxford conference paper*7 to Clausewitzs concept of the inherent superiority of the defensive form of war. That is, I do not argue that the Trinity is Clausewitzs most important concept, that the desire to convey it was his primary motivation in writing, or that all of his other insights flowed from this one. Rather, I mean simply that the Trinity is the concept that ties all of Clausewitzs many ideas together and binds them into a meaningful whole. This remains true whether Clausewitz conceived his theoretical universe with this construct in mind, or instead discovered only at the end of his efforts that the seemingly divergent roads he had been traveling all led, inexorably, to this particular intersection. An intersection is of little significance, however, without reference to the roads that run through it. Thus it is difficult to confine a discussion of the Trinity within tidy boundaries: Any comprehensive examination must lead to every major issue in On War. 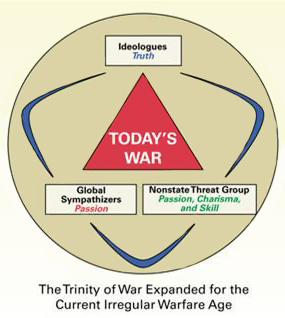 As the synthesis of his dialectic on the nature of war, the Trinity incorporates but also supersedes Clausewitzs antithesis, i.e., the famous dictum that war is merely the continuation of Politik by other means. That antithesis is almost always treated as if it were the pinnacle and summary of On Wars argument. In a sense, the Trinity also contradicts this dictum, and in yet another sense it serves to define its key termi.e., Politik. Unfortunately, it has been my dismal experience in observing Clausewitzs reception that fundamental, seemingly irresolvable, but most often unvoiced disagreements arise the moment that this word, Politik, and its most common English translations, politics and policy, are introduced. So our exploration of the Trinity must confront their various meanings and the confusion they create. I realize that most of us would prefer to skip this seemingly elementary-level exercise. But that is precisely why it is so necessary. This working translation is based on comparisons among the first edition of Vom Kriege, the 1873 translation by J.J. Graham (London: N. Trübner, 1873); the O.J. Matthijs Jolles translation (New York: Random House, 1943); and the Howard/Paret 1984 edition; and on long-running consultations with Tony Echevarria, Alan D. Beyerchen, Jon Sumida, Gebhard Schweigler, and Andreas Herberg-Rothe. Obviously, I bear sole responsibility for the result. You can compare the entire first German edition and the 1873 Graham translation side-by-side here. **The elements of the Trinity are enumerated here for the sake of clarity. There are no numbers in the original. The Howard/Paret translation (hereafter cited as H/P) of section 28 is problematic in a great many ways. My discussion here reflects an alternate translation (Text Box 1, above) based on a systematic comparison of all three major English translations with the German original. The reader may want to grab a copy of the Howard/Paret translation and open it to page 89 (in the Princeton edition) or view it on-line here. My proposed corrections have been culled in many cases from the thoughts of others in this field, remain tentative, and are advanced here for the purpose of fostering debate and further progress. It should be no source of dismay to Sir Michael Howard and Peter Paret that a whole community of scholars, given thirty years to contemplate their translation of this particular bit of text, should have come to a greater recognition of its importance and to discern alternatives in word choice more appropriate to our emerging understanding of Clausewitzs meaning(s). None of this would have happened without the impetus given to this field by their original efforts. Starting with the very first sentence, we run into problems, even before the Trinity itself is introduced. Evidently, Clausewitz believed that his discussion prior to this point should have prepared the reader to accept the metaphor that he now introduces of war as a chameleonwhich I take to mean that it easily changes its superficial appearance and coloration. But he also expects the reader to be prepared to understand that this metaphor, while pretty good as far as it goes,*10 is still insufficient, because war also changes in far deeper ways (i.e., its nature) according to the circumstances of each real-world case. By dropping the initial thus, H/P de-links the Trinity concept from the rest of the chapter, making it appear to be a new departure. The H/P translation then gives the impression that the Trinity is being offered simply as an alternative metaphor. In truth, Clausewitz has already ceased riffing on the chameleon imagery. He is actually switching to a whole new metaphor, with a new structure, new entailments, and new purposes. 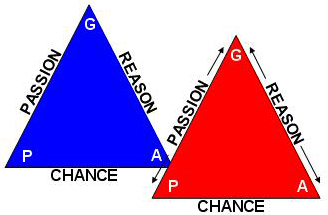 The chameleon metaphor pointed to changes in wars appearance from case to case; the Trinity addresses the underlying forces that drive those changes. H/P: What lines might best be followed to achieve this difficult task will be explored in the book on the theory of war [Book Two]. At any rate, the preliminary concept of war which we have formulated casts a first ray of light on the basic structure of theory, and enables us to make an initial differentiation and identification of its major components. As Jon Sumida put it to me in a recent letter (e-mail, 8 April 2014—this is a close paraphrasing), "Section 28's main point is that war's infinite variability in form poses extraordinary difficulties for anyone wanting to formulate a valid general theory of war, which is what Clausewitz believed his great contribution to theory would be." In this paragraph, Clausewitz confidently refers to the functions of theorya problem he had already worked through before revising Chapter 1and describes the elements of the Trinity as its main components. The next issue that arises is the very choice of the word Trinity (Dreifaltigkeit). Until recently, writers in English, at least, have largely ignored the cultural and psychological implications of this term, dripping as it is with religious implications. Since the re-emergence of religion as a strategic concern, especially since the attacks of 11 September 2001, I have been deluged with e-mails (some from markedly paranoid believers in other faiths) asking whether the Christian connotations of the English word-choice are a mere artifact of translation oras is truly the casea trustworthy reflection of the connotations of the original German. I am also asked whether this word-choice reflects some sort of mystical streak (not necessarily Christian) in Clausewitzs personality. the Clausewitzian trinity makes the most sense understood as a true trinitythree separate coexistent forces in unityand not a mere triad, which would be a simple grouping of three forces. So while Bassford is probably right that Clausewitz had no mystical intentions whatsoever here, his contemporary readership, aristocratic, educated, army officers versed in Christian doctrine of the Holy Trinity, would have grasped the difference and that primordial violence and hatred, probability and chance, and the pure reason of policy were in fusion and tension and not three entirely separated forces. in an interactive FLASH animation of the famous 3-Body Problem in Newtonian physics. is to keep our theory [of war] floating among these three tendencies, and not to try to set, or to count on, any fixed relationship among them. We can blame Summers confusion partly on H/Ps unfortunate choice in translating Clausewitzs descriptor for the links between the elements of the Trinity proper and the elements of this secondary trinity. By substituting mainly for mehr (which Ive translated as more), H/P locks each of the elements of the actual trinity far too firmly and exclusively to each of these sets of human beingsviolent emotion to the people, chance and probability to the commander and his army, and rational calculation to the government. In fact, each of the three categories that constitute the actual Trinity affects all of these human actors, to an extent that will vary wildly among societies, over time, and across situations. The army's officers and men and the political leadership are, to varying degrees in different societies, still members of the society they fight for or rule. *21 In almost all societies there is a public, whose proportion of the population varies a great deal, that expects to play a role in rational decision making. (Sometimes the only public that counts is the population of the army itself.) Commanders also indulge in rational calculation in pursuit of policy objectives. Political leaders are as often driven by personal needs as by their rational calculation of their societies' practical requirements. Events on the army's battlefields have a tremendous emotional and practical influence both on the people and on the political leadership, while popular and political factors, in turn, affect the army's performance. As Vietnam fades in salience, it becomes clearer that the political-structural notion of the PAGanswhile hardly irrelevant (and Americas recent misadventures in Iraq and Afghanistan threaten to restore its immediate importance)is much less than fundamental. Clearly, it is quite possible to fight and even win wars about which one's people don't give a damn, especially if that is the case on both sides, or if one side so vastly outclasses the other that victory comes quickly and relatively painlessly (e.g., the wars of Frederick the Great; Clinton in Bosnia). In wars in which the population is aroused, however, Clausewitz was extremely pessimistic about the prospects of the aggressor. His powerful and pervasive argument that defense is inherently the stronger form of war was never explored in any great depth, in the English language at least, until Jon Sumida published his important book Decoding Clausewitz: A New Approach to On War (University Press of Kansas, 2008). That argument turns in significant part on the passions of the people, which tend naturally to be more intense on the part of a population fighting on its own soil than they can ever be on the part of soldiers fighting far from home. This analysis has always been extremely controversial, for many reasons. For one thing, simply because the defense is inherently stronger does not mean the defender will win: There are other factors and other asymmetries to consider. Nonetheless, it has been amply borne out in examples like Spain, Russia (several times), Britain (1940), Vietnam, and now Iraq. This need not be taken as a moral condemnation of the American invasion of Iraq. The wholly justified Allied invasion of Germany in 1944 was also an act of conquest. Unfortunately, benefiting from Clausewitz's insight requires that one have the intellect and the moral courage to recognize when one is in fact waging a war of conquest. No Allied commander in 1945 Germany would have dreamed of tolerating armed local militias. It is the infinite variability among the trinity's factors and in their interaction that underlies Clausewitzs insistence on the inherent unpredictability of war. It is a classic model of Chaos, in the modern scientific sense. And it is this descriptive approach, permitting infinite variability within fundamental categories that can be identified in any context, that makes the Trinity such a promising basis for a comparative approach to military-political studies. It is perhaps understandable that thinkers hostile to the State*22 or simply focused on non-state war might reject the people/army/government construct, though their fears (in some cases advocacy) of the eclipse of the State are wildly overblown. But one has to wonder whether any warfighting political construct mustn't have analogs for each of these elementse.g., popular base, fighters, leadership. This makes the "non-trinitarian" concept a most peculiar sort of compound error. Creveld's and Keegan's assault on Clausewitz's Trinity is not only a classic "blow into the air," i.e., an assault on a position Clausewitz doesn't occupy. It is also a pointless attack on a concept that is quite useful in its own right. In any case, their failure to read the actual wording of the theory they so vociferously attack, and to grasp its deep relevance to the phenomena they describe, is hard to credit. Returning to Clausewitzs actual Trinity, its first element is violence. Here, however, Clausewitz is not talking primarily about physical violence, but about violent emotion as a motive force. 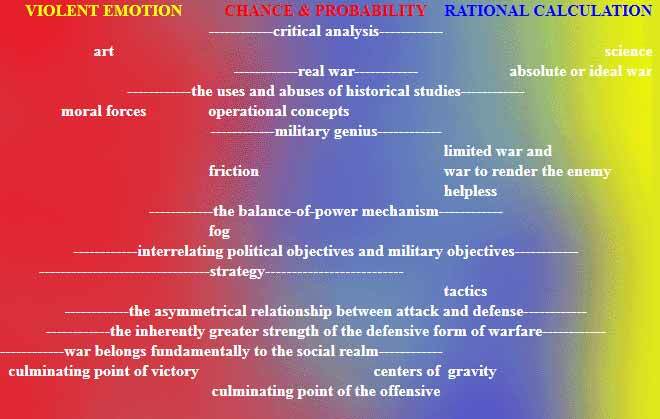 Actual physical violence can be generated by any of the elements, as Clausewitz demonstrated earlier in the chapter during his discussion of hostile intentions. These are often unaccompanied by any sort of hostile feelingse.g., violence generated as a matter of course by the simple fact of military operations (i.e., under item 2 in the list) or as the result of rational calculation (under item 3). Thus these violent emotions need not be a motivating force behind the resort to war. Whether or not they are present initially, however, they will surely be called into being by the experience of actual violence and will affect behavior (whether by their strength or by their weakness). Let us pause to note that this first category is a product of the human mind and exists only inside individual skulls, but it is quite distinct from rational calculation. The only point I want to make at the moment about reason or rationality is that, like emotion, it is a product of the individual human mind. Of course, it is quite different, with its properties of conscious ends/means calculation. As to wars subordination, we can quickly dispose of an annoying translation problem: H/Ps version of this line reads that war is subject to reason alone. There is no reason for the word alone to be in there at all: Obviously, if war is subject to two other forces as well, it cannot be subject to reason alone.*23 The correct translation for bloßen Verstande here is pure reason. The pure seems to serve no great purpose, other than perhaps to demonstrate how artificial it is to separate human reason from human emotion. It may also be a bow to Kant, or simply formulaic in nature. That leaves us with the problem of Politik. This is a huge subject, for it encompasses the entire issue of the relationship between it and war; perhaps 90% of debates about Clausewitz turn on it. Let us pause for a (long) moment and consider the meaning of those problematic words, Politik, politics, and policy. Clausewitz seldom overtly defines Politik in any detail, and when he does so the definition is shaped to fit the immediate context. In translating Politik and related words, English-speakers feel compelled to choose between politics and policy. Some even prefer the much more specialized term diplomacy, which limits the discussion to relations among organized statesthat is how Jominis Politique was usually rendered into English. Our choices can seriously distort Clausewitz's argument. Clausewitz himself would probably have been very comfortable with the word statecraft, the broad zone of concerns and activities within which "statesmen" operate. But that term avails us no greater clarity and might even lock him exclusively into the state, where so many modern writers want to (uselessly) maroon him. We are interested in what Clausewitz meant by Politik, of course, but our focus here is even more on the question of what we mean by policy and politics. The latter two terms are related but far from equivalent. Each captures a part of the meaning of Politik, but even used together they do not cover quite the same ground. Often, it seems, we do not understand even our own translations of On War, much less the original. That is an interesting and revealing notion. In itself, however, it is of no great use as a theoretical distinction, especially since wars are waged by all kinds of political actors, not just great states. We must find a more fundamental and rigorous relationship between the two words. I dont mean to impose such a distinction, but rather to derive one from usage (and from necessity). We are looking, of course, for a universal definition that applies across cultures and time, but one not contradicted by Clausewitzs own usage. In practice, the distinctions I propose tend (but only that) to be consistent with the choices made in the H/P translation, because we actually understand the words in the same way. I've simply made the distinctions more overt and more consistent. 2. "Politics" is the highly variable process by which power is distributed in any society: the family, the office, a religious order, a tribe, the state, an empire, a region, an alliance, the international community. The process of distributing power may be fairly orderlythrough consensus, inheritance, election, some time-honored tradition. Or it may be chaoticthrough intrigue, assassination, revolution, and warfare. Whatever process may be in place at any given time, politics is inherently dynamic and the process is always under pressures for change. Knowing that war is an expression of politics is of no use in grasping any particular situation unless we understand the political structures, processes, issues, and dynamics of that specific context. I frequently hear that Clausewitzian thinking may apply to wars with political objectives (using war here in a sloppy, unilateral manner) but not to wars over economic issues or with economic objectives. In fact, of course, politics and economics are hardly exclusive of one another. First, even if you treat them as two isolated phenomena, they are very similar types of systems. But in reality, economics is just an element of politics: If politics is the general process by which general power is distributed, economics is just a subsystem by which power specifically over material wealth is distributed. In some societies, as in command economies, there is virtually no distinction. Even in market democracies, how much of domestic politics is really about the redistribution of wealth? Economic issues become politicized when strictly command or market processes are perceived to be providing economic outcomes unacceptable to groups capable of responding to the inequity with other kinds of tools (i.e., other means, which may or may not include violence). Thus, economic objectives easily become political objectives, and these, in turn, may be translated into military objectives. The key characteristics of politics, however, are that it is multilateral and interactivealways involving give and take, interaction, competition, struggle. Political events and their outcomes are the product of conflicting, contradictory, sometimes cooperating or compromising, but often antagonistic forces, always modulated by chance. Outcomes are seldom if ever precisely what any individual participant desired or intended. Thus politics cannot be described as a rational process (though a community may achieve considerable success in rationally designing its internal political institutions so as to civilize the process). Warlike politicsis inherently multilateral, of course, though Clausewitz often uses the term sloppily in the sense of a unilateral resort to organized violence. I remember offering this broad definition over lunch to a prominent critic of Clausewitz, stressing the notion that politics permeates human interactions at every level of organization. His response was astonishment: But thats so banal! So mundane! Why, it applies to everything!*26 And so it does. Clausewitz is describing the common, everyday world we actually live in. His definitions of such pervasive realities as power and politics had best be as mundane as possible. 3. "Policy," in contrast to politics, is unilateral and rational. Please do not confuse rationality with wisdom, however. As you may already suspect, there is no shortage of unwise policy out there. Policy (like strategy) represents a conscious effort by one entity in the political arena to bend its own power to the accomplishment of some purposesome positive objective, perhaps, or merely the continuation of its own power or existence. Policy is the rational and one-sided subcomponent of politics, the reasoned purposes and actions of each of the various individual actors in the political struggle. The key distinction between politics and policy lies in interactivity. That is, politics is a multilateral phenomenon, whereas policy is the unilateral subcomponent thereof. My ally, myself, and my enemy are all bound up together in politics, but we each have our own policies. I have my policy/policies/strategies; my ally has his policy; as an alliance, we have our policy. My enemy also has his own policy. But though they shared the same political stage and then joined together in war, Hitler and Churchill did not share a policy, and the war as a whole had no purpose, objects, or aims at all (unless you assign some guiding teleological intelligence to the historical process, which I do not, nor did Clausewitz). This makes policy and politics very different thingseven though each side's policy is produced via internal political processes (reflecting the nested, fractal *27 nature of human political organization). *28 This is not of merely semantic importance. The distinction is crucial, and there is a high price for confusion. The dangers inherent in thinking that war is merely the continuation of [unilateral] policy are obvious in the Bush administration's strategies in its invasion and occupation of Iraq: They include most of what Colin Gray has listed as characteristics of American strategic culture: indifference to history; the engineering style and dogged pursuit of the technical fix; impatience; blindness to cultural differences, indifference to strategy; and the evasion of politics. *29 Thus that very common translation of Politik is Clausewitzian only in a highly defective sense. Within the Trinity discussion itself, because the third element is wars subordination to rationality, it may be entirely appropriate to use the word policy in translating that particular clause. But we must always bear in mind the awkward fact that, while Clausewitz seems in this discussion to be speaking from the perspective of one side in a war [e.g., the people (singular), the government (singular), and the commander and his army (singulars)], his topic in this chapter is the nature of war, which must by definition be multilateral. The clash of two or more rational, opposing, unilateral policies brings us into the realm of multilateral politics. Thus there really is no reason to avoid translating the Trinity's politischen Werkzeuges literally, i.e., as "political instrument." A simplistic diagram. In reality, of course, the structure of politics is not nearly as hierarchical as such models would indicate. There are political and even policy ties among subgroups in different polities and between polities and subgroups in other polities. Trans-polity subgroups may overshadow one, some, or all polities in some situations. A group of polities (e.g., an alliance) has collective policies as well as political interactions with other polities and groups of polities. Etc., etc. The key points are a) that politics is the general phenomenon within which policy exists, b) that policy reflects the unilateral interest of a distinct actor while politics describes the bi- or multilateral interaction among actors, and c) that policy and politics are nested, fractal phenomena that tend to look similar at different scales of space, time, and numbers of people involved. That brings us to the problem of instrumentality. Force or violence is, of course, an instrument, in the sense of a hand-tool or weapon, of unilateral policy. War, however, must be bi- or multilateral in order to exist. Thus, while military force is indeed an instrument of unilateral policy, we should see war as an instrument of politics only in a very different, multilateral sense, as the basketball court is an instrument for the teams to play the game on, as the market is an instrument of trade, or the courtroom an instrument of litigation (which, as Clausewitz says, so closely resembles war). *31 This is precisely the same logic Clausewitz follows in arguing that war belongs neither to the domain of art (though he is willing to place [unilateral] strategy there) nor to the domain of science (though he places tactics there). This is a source of much confusion, and were we able to give editorial advice to a living Clausewitz, we would have to insist that he be more consistent in distinguishing between military force as a tool or weapon of one side and war as an instrument or vehicle of multilateral interaction. Clausewitz seems simply to assume that his readers will distinguish, on the fly, whether he is speaking in the unilateral or the multilateral sense. After all, he has stressed time and again the interactive nature of war, and, of course, his own languages term Politik encompasses both our multilateral politics and our unilateral policy. But this casual stance results in constant confusion for the translator and the reader. This is especially true regarding his next chapters discussion of purpose and means, whichagain, assuming that war as a whole has no teleological purposeare by nature unilateral. When we talk about the fundamental poles between which real-world wars vary, war of limited aim vs war to render [the enemy] politically helpless or militarily impotent, obviously (to Clausewitz), these are unilateral objectives rather than types of war in a wholistic sense. And they can coexistthat is, I may be fighting for limited objectives while my opponent is seeking my total destruction. Indeed, I can be fighting for very limited objectives against one enemy in a given theater of war while fighting for quite extreme objectives against another enemy in the same theater. If I think that my opponents objectives and behavior will be constrained simply because my objectives are limited, however, I will never understand our interaction. It can be taken as agreed that the aim of policy is to unify and reconcile all aspects of internal administration as well as of spiritual values, and whatever else the moral philosopher may care to add. Policy, of course, is nothing in itself; it is simply the trustee for all these interests against other states. There is some debate as to the reasons behind Clausewitzs alleged failure to address policy itself. One view is that Clausewitz was politically cowed in the age of reaction after Napoleons defeat, and thus reluctant to address concrete political issues. This is a bit absurd, given Clausewitzs political boldness during the later Napoleonic Wars, as well as the inflammatory character of some of his other writings (such as his pitiless criticism of the Prussian state in his Observations on Prussia in Her Great Catastrophe, written in the 1820s but unpublishable for generations). And Clausewitz could easily have made his theoretical points using non-Prussian casesexamples of bad policy leading to military disaster are not, after all, very hard to find. In any case, his wife Maries preface gives a very clear explanation of Clausewitzs determination not to publish while he was still alive, which obviated any political motives for avoiding touchy subjects. Personally, I would argue that Clausewitz's focus on the relationship of policy to the military conduct of war,*35 rather than on what constitutes good policy itself, was simply an authors act of economy. One gargantuan topic at a time, please. On the other hand, he's offering some good advice here, not necessarily a prediction. It seems rather superfluous to suggest that perhaps Clausewitz actually grasped the facts that there is such a thing as bad policy, that bad policy has military consequences, and that this in turn may have consequences for both the political leadership and the community whose interests it is supposed to represent. After all, despite his professional admiration of Napoleon as a soldier, Clausewitz had no sympathy whatsoever for the policies and political objectives of Napoleonic France, which he considered to be inherently flawed and very likely doomed to failure by their very nature. Having beaten policy and politics to death, we now arrive, at last, at the second element of the Trinity: the play (Id prefer hed said interplay, just to nail the point down) of chance and probability. I have changed the sequence in this discussion in order to stress the important point that both emotion and reason are products of the human mind. In that sense, they are subjective forces. They are the internal sources of our desires and the internal governors of our efforts. While they are so different from one another that we must treat them separately, they are also intrinsically linked. There can be no rational consideration of goals without taking into account the emotions that give rise to the goals in the first place. Can we imagine policy, politics, economics, or reproduction without fear, love, greed, lust, or hope? But the chances and probabilities of which Clausewitz speaks are external to human desire and intentthey represent, purely and simply, the concrete (in this sense, objective) reality with which the actors must cope. That reality yields to their hopes, dreams, and plans only with great resistance (friction) and at great cost to themselves in time, energy, resources, and will. And, in the case of war, blood. Obviously, such factors are at work during the making of our policy and strategy as well. These, once produced, are unilateral, but their production is via an internally multilateral, and therefore political, process. 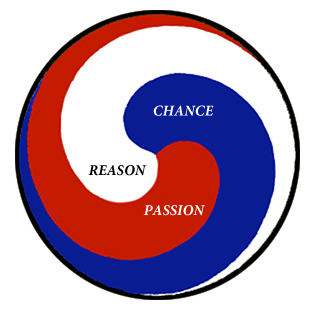 We have to assume that Clausewitz used the words chance and probability in tandem for a reason. That is, chance and probability are not a redundancy. Rather, they are two distinctly different things. Chance, in a pure sense, is arbitrary and incalculable. We can prepare for it only in a general manner. Probability, on the other hand, refers to things whose likelihood can to some useful extent be estimated. It is chance that there is a mountain range between France and Spain; it is quite a good probability that it will still be there when our armies arrive on the border. It is also chance that a copy of General Lees order of battle should be carelessly wrapped around a bunch of cigars and lost by their ownerand still moreso that the package should be found in the field, recognized, and delivered in a timely manner to the appropriate headquarters. What, however, is the probability that a George McClellan will actually act upon such a chance windfall? We would be fools to plan on such a chance occurrence, but also fools not to have a general apparatus for making and dealing with such finds, and fools for failing to act upon one when it occurs. In short, this last element of the Trinity represents concrete reality, i.e., everything outside of our own skull and its emotions and calculations. It is true that in the military conduct of war, Clausewitzs primary focus, these factors may loom largest for the commander and his army. The number, scope, range, tempo, and sheer variety of chance and probabilistic factors are massive at that level. But political leaders and policy makers must deal with such factors as well. It is therefore absurd to thinkor to claim that Clausewitz thoughtthat courage, creativity, and skill are mainly requirements for military leaders. Non-state war is one of the more amusing labels contemporary writers use when pursuing non-Clausewitzian ways to view current events. We need to explore it, because the notion that Clausewitzian theory applies only to warfare among well-defined Weberian states underlies most contemporary critiques of Clausewitz and most discussions of his Trinitarian concept. War among non-state entities is, of course, extremely common, both historically and in the present. It is, in fact, the normal and natural situation of humankind. Any survey of the actual anthropological literature on the subject*39 (as opposed to certain historians faux-anthropological posturings) will make this abundantly clear. But then, so would simply examining the history of virtually any society. Nearly all of the discussions of non-state warfare that appear in the field of national security studies, however, are ipso facto aimed at informing the security forces of modern states about their roles in such wars. Unfortunately for the cause of logical thought on the subject, the moment a statee.g., the United States, Israel, Indonesiagets involved in such a war, it ceases to be non-state war. And though the non-state warfare literature tends to be extremely pessimistic about the states competence and chances for success in such warfare, the obvious historical truth of the matter is that the modern, Western-style state has been extraordinarily successful in eliminating non-state military competitors. It is that very success which accounts for the wide-spread astonishment when such competition periodically reappears. Unfortunately, ones successful past experience is useful only if one happens to be aware of it. To be a bit more generous to the "New Wars" scholars, it is not merely ignorance of the historical success of the state in such warfare that inhibits an effective absorption of past strategic lessons. States achieved their successes through wildly varied combinations of different strategies. These included admirable advances like providing reliable, impartial courts, equality before the law, etc., i.e., all of the gentle and responsible traits of good governance advocated by popular counterinsurgency experts. But the states success has depended more or less equally upon its demonstrated readiness to employ brutal, often quite arbitrary and unfair violencesometimes directed at categories of enemies so broad as to justify accusations of genocide. Such indiscriminant violence is often unnecessary and thus counterproductive, the product of viciousness and incompetence. On the other hand, sometimes it is merely the inevitable result of Clausewitzian frictionbeing fair, or reasonable, or even appearing to be, is sometimes just too damned hard to actually pull off, whatever the ethical character of the political objectives. Our ability to find the right balance, to understand that either moderation or excess can be suicidal depending on the situation, is crippled by an inevitable collision between the strategists immediate need for unvarnished truth and the states permanent need for a very thick varnish of unifying mythology. It is one of the extreme ironies of human nature that even the most violent founders of successful states, often guilty of crimes beyond reckoning, tend to love their own children and to crave their admiration. The historical mythology they generate in order to preserve their achievement must obscure the political simplifications and the hard-to-ethically-justify violence that resulted. Success in this subterfuge may actually create the basis for a stable society and the subsequent growth of a genuine public morality amongst their successors. How else can we explain the presence in Russian history of a Kerensky, a Gorbachev? This poses a problem, one that Clausewitz addressed only obliquely: Can a decent society founded on comfortable myths conduct the kind of strategies that actually created it in the first place? Given the inevitable divergences in interests within any given group, Clausewitz's convenient assumption about policy (i.e., that it is "representative of all interests of the community") is nonetheless a realistic assumption, so long as policy is not so visibly corrupt or disastrous as to break the communitys cohesion and its submission to existing leadership. In practice, of course, bad policy does lead to such ruptures. Badly managed external wars, in particular, often lead to internal strife, in which war may become a continuation of internal politics by other means. Or, rather, a continuation of politics that once was internal but has nowas the earlier community fragmentsbecome external politics among an enlarged set of smaller players. These are not "non-state" wars: the original state, various state wannabes, and often other intervening states are among the players. The eventual outcome is usually one or more new and stronger states. The Chinese Civil War raged for four decades and involved a huge number of competing political entities, yet somehow the Chinese state emerged on topand today brooks no challengers. We tend to be unaware of this history, not because it is unimportant but because the myth of the modern state demands that it be minimized. Peasant rebellions and the like may be large in scale and hard-fought, but they tend to be swept under the historical rug. Military historians are generally obsessed with major battles in the open field, which are uncharacteristic of such wars. They are in any case hard to study because the losing side usually leaves few survivors and few if any records. The victorious warrior aristocrats don't boast too conspicuously of their mass butchery of the lower orders, in part because it is embarassing to acknowledge that such people could have put up a serious fight in the first place. More broadly, no wise person who enjoys the comforts, security, and freedom of life in a modern Western state, defined by Max Weber as "that organization which (successfully) maintains a monopoly on the legitimate use of violence within a given territory," really wants to forcefully remind people that there have always been other options. Certainly no War College faculty, made up of career government employees, would feel natural doing so. Because of the demands and power of the statist myth, we systematically fail to study intra-state war, even when it is part and parcel of "normal" state-on-state conflict. War College students in America may learn about the Franco-Prussian War of 1870-71, normally presented as a struggle between the French state and the Prussian statei.e., without reference to the other German participants or the alternative governments and armies in France. But they will normally be taught nothing about the Revolutions of 1848, which created the context for the war. Nor will they study the War of the Paris Commune, a bloody part of the wars messy and complex end-game, which left a mark on the French nation arguably greater than did the defeat by Prussia. Neither will they study the problems the Union Army faced during "Reconstruction" of the conquered Confederacy. No, the American Civil War began in 1861 and ended in 1865. The preliminary struggles in Kansas, Missouri, and at Harper's Ferry, and the subsequent failures of occupation and Reconstruction culminating in the political compromise of 1876, exist only in some other universe. Amongst students raised on the healing national myth of Appomattox, the surprise attending the conflict in Iraq after the fall of Saddam should come as no surprise at all. Wars within a disintegrating state or other long-established political context tend by nature to be especially confusing and complex. The breakdown of established, visible, public structures that accompanies an insurgency adds great ambiguity. New structures struggle to take form but also struggle to hide from still-dangerous remnants of the old order, competitors, or strong external powers who may intervene. Internal wars tend to have a lot of players, at least at first, and the relative complexity of multilateral warfare is always high. Especially if the society in question tends strongly by nature or history to be a single political unit, there is likely to be only one survivor among the contending factionsthus the stakes will be very high for all and the intensity of the struggle can be expected to be correspondingly great. Uncertainty, ambiguity, complexity, and danger ramp up confusion. They therefore ramp up fear throughout a society, to levels seen, in conventional wars, only on the battlefield itself. The structure of the resulting fur-ball may become so complex as to be incomprehensible, not only to analysts but to the participants themselves. In such circumstances, the complexities, ambiguities, and levels of obfuscation necessary for the various players' survival are so high that the competing leaderships will find rational policymaking crushingly difficult. Fighting organizations may find themselves cut off from their originating populations and from their political leadership. A leadership group may be eliminated, perhaps to be replaced by a former enemy or painfully regenerated by elements of the population or its fighting forces. The only rational solution for political or military leaders may be paralysisi.e., persistence in strategies that may lead nowhere but at least serve to keep the game in play. Similarly, historians and other analysts may find it difficult or impossible to produce the credible illusion of clarity that they and their audiences naturally crave. * a war of secession (in which the stable resolution may be two or more successor states). If the secession fails, later politicians and their historians will call it a "civil war." * an imperial war in which one population will emerge as the victor over others within a single territorial state that is, in fact, a multi-societal empire rather than a "nation-state" (however the imperial myth or ideology may portray it). In every case, both versions of the Trinity will remain useful tools for breaking into the problem. The PAGan people/army/government structures (or their population-base/fighting organization/leadership analogs) are still there, even if hidden in the fog, though the number and the complexity of their intersections may multiply. How could we possibly understand a conflict without identifying these players? It is quite conceivable that there may be populations without leadership, or fighting organizations whose leaders represents no interests but their own. But these cases still fall within the construct, the purpose of which is not to force the contending parties into mirror-image molds, but rather to provide a meaningful basis for understanding the similarities and differences among them. Clausewitz's actual trinitarian formulation also continues to apply. The rolling interplay among the participants' emotions, the impacts of chance and probability on the political and military battlefields, and the considered calculations of leaders on all sideshowever blinded by uncertainty and enshrouded in the mystery required for survival in such an environmentwill continue to drive events. It seems obvious that civil wars, rebellions, and revolutionsof which Clausewitz was well aware, and which by definition take place within a single state or societyare expressions of internal politics, some of it quite private in nature. And certainly he was aware that the foreign policies and strategies of states are driven in very large part by the unilateral, purely internal concerns of their rulers. It is ultimately impossible to disentangle internal and external politics. In any case, we are well aware that war occurs even in the absence of the state. Thus there seems to be little point, and less value, to clinging to the interstate-only interpretation of the famous dictum, in terms either of Clausewitzs original intent or of our own understanding of it. On the other hand, there is great value in recognizing that, if we are to understand and describe war in any context as an expression of politics, it is necessary to understand the structure, methods, issues, and dynamics of politics in that context. If the state is not part of that particular context, or if the state is only one of many players, then we simply have to work through the implications of that fact. This, it seems fairly obvious, is what Clausewitz expected us to do. The only alternative to making sense of the struggle in this manner is to assume, as many in fact do, that the struggle makes no sense in the first place. Collectively, of course, that may well be true: The potential benefits of any war tend to flow only to a few (though there are exceptions to this, as to any generalization), and even those few may find the outcome a net loss. But to any individual or group caught up in the maelstrom, that conclusion is likely to be worthless as a guide to either understanding or action. visual metaphors for Clausewitz's trinity. A good example of why we ought to stick with Clausewitz's original model. 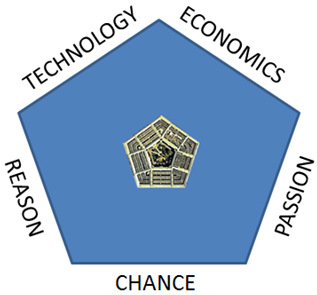 This model has obvious appeal for the U.S. DoD, but in fact economic and technological factors, which of course existed even in Clausewitz's day (and Caesar's), are covered under the "chance & probability" heading, which accounts for all contextual aspects. This one has some interesting cross-cultural resonances. 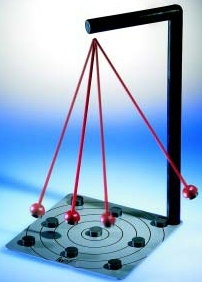 metaphor would be that offered by Figure 1 (if we could make it move). dynamic, but in this case far too regular. features of the intermediate polyhedra." other Clausewitzian concepts under the categories of the Trinity. See also ZenPundit, two discussions on the present paper, "Bassford's Dynamic Trinitarianism." [*4] James Carville, as [apparently] quoted in Barry Schwartz, In 'Sticky' Ideas, More Is Less, Washington Post, Wednesday, January 17, 2007, p.C08, a review of Chip and Dan Heath, Made to Stick: Why Some Ideas Survive and Others Die (New York: Random House, 2007). [*5] See Alans contribution to the conference, or Alan D. Beyerchen, "Clausewitz, Nonlinearity and the Unpredictability of War," International Security, 17:3 (Winter, 1992), pp. 59-90. I have long argued that this is the most important article published on Clausewitz in the past thirty years. It is also available in French: "Clausewitz: Non Linéarité et Imprévisibilité de la Guerre," Theorie, Littérature, Enseignement, 12 (1994), pp165-98. [*6] Azar Gats discussions of the evolution of Clausewitzs thinking seems to be the source of this widespread notion. I have no particular opinion on his reconstruction, other than that it is largely irrelevant. Gats obsession with the ghosts of Clausewitzs earlier conceptions, however interesting those ghosts may be in helping us understand Clausewitzs personal evolution, serves only to distort our understanding of his mature thought. [*7] A newer version of which appears as Jon Sumidas contribution to the conference proceedings. See also his book, Decoding Clausewitz: A New Approach to On War. Lawrence, KS: University Press of Kansas, 2008. [*8] The terms dialectic, thesis, antithesis, and synthesis appear in On War, respectively, one, three, four, and one time each. [*9] Here I have used the translation by Jolles, because H/P is confusing as regards the attitude of theory towards the tendency of war in the real world to escalate towards the absolute. Jolles made it clear that Clausewitz is talking about a delusory form of theory rather than the approach to theory he himself espoused. Actually, however, Clausewitz did not use the word theory at all in this paragraph. [*10] Plenty of sophisticated writers are perfectly happy with this initial metaphor: War is a chameleon, possessed of an infinite capacity to adapt itself to changing circumstances. Andrew Bacevich, Debellicised, London Review of Books, 3 March 2005. [*11] See, for instance, Stephen Jay Goulds exegesis of the three central principles constituting a tripod of necessary support for Darwinian evolutionism, in The Structure of Evolutionary Theory (Cambridge, MA: The Belknap Press, 2002), p.11. [*12] See J.P. Mallory, In Search of the Indo-Europeans: Language, Archaeology and Myth (London: Thames and Hudson, 1989), p.139 and passim. [*13] [J.E. Edmonds], referring to Fullers trinities in a review of Fuller's Foundations of the Science of War (London: Hutchinson and Company, 1926), Army Quarterly, 12 (1926), 165-66. [*14] That is, major effects from minor or even undetected inputsAKA the Butterfly Effectare a perfectly valid expectation for anyone familiar with Chaos or Complexity theory or nonlinear mathematics, but they appear inexplicable, counterintuitive, and unscientific to thinkers trained in the linearizing tradition. Calling the latter view Newtonian is a bit unfair to Newton himself. [*15] Responding to this, Andreas noted the following: The context in which Clausewitz took notice of the concept of the trinity is in my opinion clearly the book Anthropology by Henrik Steffens (1822), which ends with praising the trinityand as we know, Steffens lectured the whole winter 1824/25 after an invitation by Gneisenau, if I remember right, and Clausewitz didn't miss any of the lectures. Taking into account the importance of the trinity for Steffens and that Clausewitz attended his lectures the whole winter, it seems to me very clear that there is a connection between Steffens Christian/romantic concept of the trinity and that of Clausewitz. Of course, Clausewitz used it in a non-religious way, one could perhaps say in an analytical sense, but the methodological approach is just the same: God the father = Force/violence as generating principle; the son = the army and its commander as the mediating tendency; and finally the Holy Spirit as governing principle, in Steffen's term Regierer. [And Clausewitzs term, usually translated as government, is Regierung.] We could probably generate an entire cottage industry with this issue, to no useful purpose. In any case, Clausewitz did not see violent emotion as any more a "generating" principle than the other two elements of the trinity, since he was clear that physical violence or war could just as well be generated via chance or rational calculation. [*16] I seem to be having some success selling this: Google recently gave me 1010 links for +"fascinating trinity" +war, only a few of which were directly to my own writings. Of course, some had nothing to do with Clausewitz, either. A video of the experiment Clausewitz describes can be found at http://www.clausewitz.com/video/romp2.mov. [*17] Roger D. Carstens, Talk the walk on Iraq, The Washington Times, August 12, 2002, lists these three nouns as the Trinity. In this case, Carstens may simply have been a victim of his editors, but Ive seen this formula elsewhere as well. [*18] I believe that I myself, in an earlier incarnation, am responsible for this last one. [*19] I have written about this at length elsewhere. See especially Christopher Bassford and Edward J. Villacres, "Reclaiming the Clausewitzian Trinity," Parameters, Autumn 1995. [*20] Harry G. Summers, Jr., On Strategy: A Critical Analysis of the Vietnam War (written at the U.S. Army War College c.1981; published Novato, CA: Presidio Press, 1982). In conversations I had with Harry in the late 1980s, I gathered that he was aware of both trinities, but he largely dismissed the Trinity proper as a meaningless abstraction. In later conversations, however, it was clear that hed entirely forgotten the original formulation. [*21] Exceptions do occur, of course, e.g., the Mamertines in ancient Sicily. The theoretical construct can handle such variations. [*22] "The state's most remarkable products to date have been Hiroshima and Auschwitz.... Whatever the future may bring, it cannot be much worse." Martin van Creveld, "The Fate of the State," Parameters, Spring 1996. In van Creveld's case, such statements may merely reflect pessimism. But hostility to the state has characterized hostile treatments of Clausewitz at least since Anatol Rapoport's long and atrocious introduction to the Penguin edition of On War, first published in 1968, which was animated by outrage at Henry Kissinger's "neo-Clausewitzianism." [*23] This error appears to be in part a simple mistranslation and in part an erroneous repetition of the phrase from paragraph 4, government alone. It may also reflect the general tendency in H/P to overemphasize the rational elements in Clausewitzs approach. [*24] Not an exact quote, but I believe Ive captured the essence. [*25] In this discussion, I am to some rather large extent plagiarizing myself from the sections on policy and politics in MCDP 1-1: Strategy (United States Marine Corps, 1997). However, this definition is essentially congruent with Max Weber's: "'politics' for us means striving to share power or striving to influence the distribution of power, either among states or among groups within a state." Max Weber, lecture "Politics as a Vocation," January 1919. [*26] This is the same kind of mentality that insists on describing Clausewitzs real war as some very particular sub-type, when in fact all it means is war as we really experience it, in all of its real-world variety. [*27] Fractal is a term from nonlinear geometry. Here, it refers to the tendency of patterns to look similar at different scalese.g., the surface of a rock under a microscope looks rather like the face of a rock cliff or an aerial photo of a mountain range; the veining in a leaf is similar to the branching of the tree, etc. [*28] Tactics, operations, military strategy, grand strategy, and policy are all essentially the same thingprocesses of interrelating means and endsat different scales of time, space, and numbers of people and resources involved. [*29] Colin S. Gray, "History and Strategic Culture," in Williamson Murray, MacGregor Knox, and Alvin Bernstein, Editors, The Making of Strategy: Rulers, States, and War (New York, NY: Cambridge University Press, 1994), pp. 592-598. Ive listed six characteristics out of Grays eight. [*30] Book 8, Chapter 6B., p.605 in Howard/Paret. [*33] Clausewitz, On War, H/P, p.606. [*35] As in his discussion of civil-military relations in Book 8, Chapter 6. [*37] As we are apt to perceive them when their interests diverge from our own. [*38] Book 1, Chapter 7, Friction in War, H/P p.119. [*39] See, for examples, Lawrence H. Keeley, War Before Civilization: The Myth of the Peaceful Savage (New York: Oxford University Press, 1996); Jean Guilaine and Jean Zammit, trans. Melanie Hersey, The Origins of War: Violence in Prehistory (Oxford: Blackwell, 2005); Debra L. Martin and David W. Freyer, eds., Troubled Times: Violence and Warfare in the Past (Amsterdam: Gordon and Breach, 1997). [*41] Michael Howard, "The Military Philosopher," Times Literary Supplement, June 25, 1976, 754-755.